My regular readers may have noticed my frequent references to the lively progressive rock scene in the northwestern Italian region of Liguria, particularly as regards the great seaport of Genoa – supported by the activity of well-known independent labels based in the area (such as Mellow Records and Black Widow) in promoting a genre that has put firm and enduring roots in the Italian music scene since the early Seventies. Sadly, as some of my readers may know, at the end of October the whole region was affected by major flooding, which caused very serious damage and loss of life, especially in the beautiful area known as the Cinque Terre. As a number of circumstances (such as the Japan earthquake) have proved, prog artists – in spite of the airy-fairy stereotype perpetuated by the media – do have a keen social conscience. 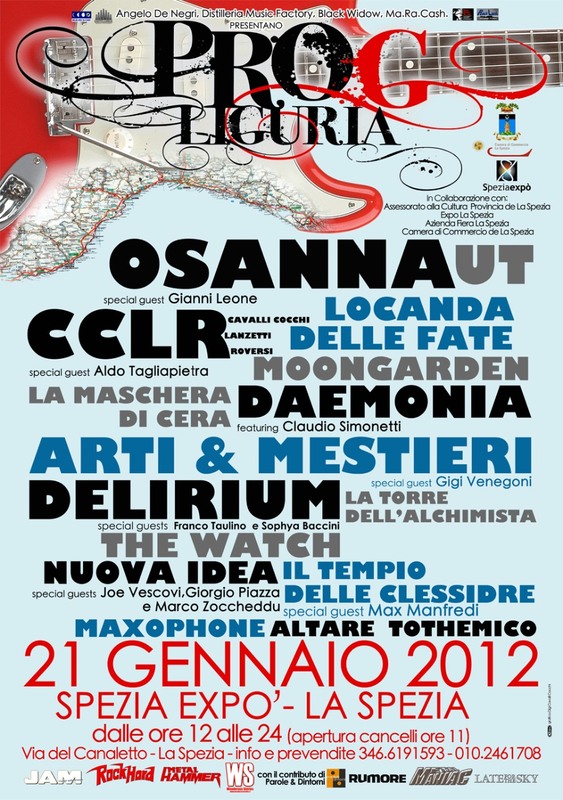 In order to raise funds to help the local population to cope with the aftermath of the floods, a one-day festival called ProG Liguria will be hosted by the port city of La Spezia, the administrative centre of the area affected by the natural disaster, on January 21, 2012. The event, organized by Genoa-based architect and longtime prog fan Angelo De Negri and independent labels Black Widow, Ma.Ra.Cash and Distilleria Music Factory, will also involve the collaboration of the thriving, internationally renowned tourist and food industry of the La Spezia province. ProG Liguria will last from noon to midnight, and feature a number of high-profile Italian prog bands and artists, many of whom have been featured on this blog: legendary Seventies acts such as Osanna (with special guest Gianni Leone), Delirium (with special guests Sophya Baccini and Franco Taulino), Arti e Mestieri (with special guest Gigi Venegoni), Nuova Idea (with special guests Joe Vescovi, Giorgio Piazza and Marco Zoccheddu), Locanda delle Fate and Maxophone; rising stars such as Il Tempio delle Clessidre (with special guest Max Manfredi), The Watch, La Maschera di Cera, La Torre dell’Alchimista, Moongarden and Altare Thotemico; Claudio Simonetti’s project Daemonia (familiar to those who attended ROSfest 2011); supergroup CCLR (Cavalli Cocchi, Lanzetti, Roversi, with special guest Aldo Tagliapietra), and New Trolls offshoot UT – Uno Tempore (featuring drummer Gianni Belleno). Anyone who is planning to be in Italy in the month of January should not miss this once-in-a-lifetime event. Hopefully more details (such as ticket prices) will be forthcoming in the next few weeks.